The lack of formal financial services in rural areas may inhibit farmers from saving, investing, and smoothing their consumption. Researchers analyzed the effect of reducing barriers to saving in rural Malawi on savings behavior, investment in agricultural inputs, and consumption. They found that farmers with access to formal savings accounts preserved greater amounts of savings throughout both the harvest and planting seasons. Furthermore, they cultivated significantly more land, invested more in agricultural inputs, and increased their consumption. On average, developing countries have fewer than 12 bank branches per 100,000 adults, and people deposit money at a rate one-third of that in developed countries.1 This lack of formal financial services, along with many other factors, may inhibit farmers and other entrepreneurs, particularly in rural areas, from increasing savings and investments, and smoothing household consumption. Financial services could help farmers to accumulate funds to purchase tools such as fertilizer which are helpful for increasing production. If barriers to financial services are reduced or eliminated by offering enhanced savings products, what is the impact on the use of different agricultural inputs, farm output, and overall well-being in rural farming households? 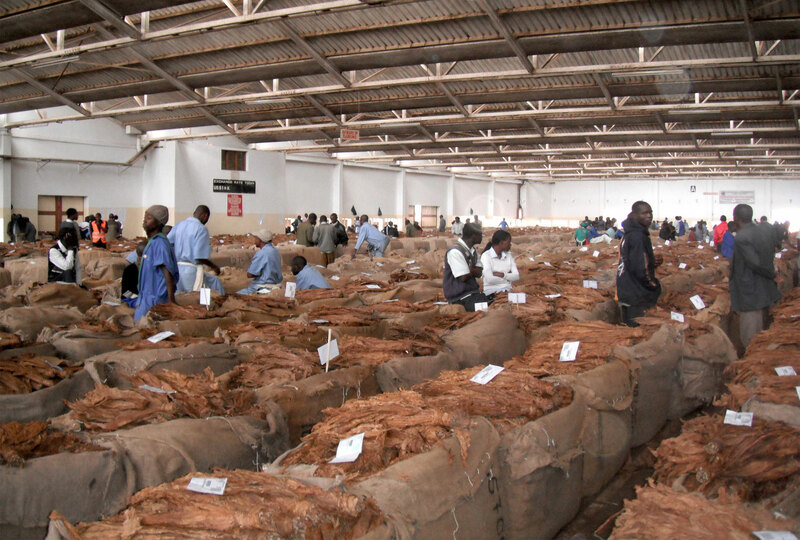 Tobacco is one of Malawi's primary exports, employing many of the country's farmers. Income volatility influenced by macroeconomic forces can be particularly harmful to those farmers living near the poverty line, causing households to skip meals and forgo necessary healthcare expenses. Opportunity International, a nonprofit financial services organization, opened the Opportunity Bank of Malawi (OBM) in 2003 with a license from the Central Bank of Malawi. OBM provides financial services to the rural poor and has partnered with researchers and two private agricultural buyers, Alliance One and Limbe Leaf, to offer enhanced savings products to tobacco farmers. The study assessed the impact of OBM's savings programs on the behavior and well-being of local farmers. Farmers were organized in farmers clubs, with an average of 10-20 members, by one of the agricultural buyers. In exchange for group loans in the form of fertilizer and extension services, administered by OBM, the club allowed the commercial buyer to make the first offer on the national auction floor, essentially creating an exclusive relationship. Farmer clubs in this sample were randomly assigned to one of two savings account treatment groups or a comparison group. Clubs in one of the treatment groups, the "ordinary savings" group, were offered assistance regarding account opening as well as the opportunity to have harvest proceeds directly deposited into accounts under their individual names (instead of the club account) with an annual interest rate of 2.5 percent. While those in the ordinary savings group were only offered one account, clubs in the other treatment group, the "commitment" group, had the option of opening an additional account with commitment features that allowed them to specify an amount of money to be frozen until a specified date (e.g. immediately prior to the planting season, so that funds are preserved for farm input purchases). The comparison group was offered no savings facilitation. To assess the impact of public information on financial behavior, farmer clubs in both treatment groups were randomly assigned to one of three raffle schemes providing information about club level savings. Raffle tickets to win a bicycle or a bag of fertilizer were distributed to participants on two occasions based on savings balances as of two pre-announced dates. One third of farmers received raffle tickets in private, one third received tickets in public when names and numbers of tickets were announced to the club, and one third was ineligible for the raffle. Savings Behavior: 19.4 percent of respondents offered any savings product opened individual bank accounts and made direct deposits of tobacco crop proceeds. Take-up was similar for both the commitment and ordinary treatments. In both treatment groups, the total amount of direct deposits was MK 17,609 (US$121) greater than direct deposits in the comparison group which deposited an average of MK 3,281 (US$22). The vast majority of deposits were into the ordinary accounts, even for the group with commitment accounts. Nevertheless, the encouragement design of the commitment account had the intended effect of increasing savings use. Average monthly deposits for individuals in both the commitment and ordinary treatments are quite similar in magnitude to average withdrawals, indicating that the majority of deposited funds were withdrawn soon thereafter, likely because of large transaction costs associated with getting to the bank. Funds into commitment accounts stayed in accounts for longer periods of time compared to ordinary accounts, but the amount of money involved in these transactions was much lower than in ordinary accounts, only MK 668 (US$4.60). Results suggest that both types of savings accounts had a positive impact on savings preservation during both harvest and planting season, with the commitment treatment providing an additional boost to savings on top of the impact of the ordinary account. Over a year later, individuals assigned to a savings treatment bank were more likely to own a fixed deposit account and continued to use the ordinary accounts, suggesting the treatment group found something of value in the savings products offered. Inputs, crop sales, and expenditures: Farmers in either savings group cultivated 0.30 more acres of land than farmers in the comparison group, who cultivated an average of 4.28 acres. Moreover, the treatment had a positive impact on the average total monetary value of agricultural inputs, which increased 13.3 percent relative to the comparison group. These increases in land under cultivation and inputs used by treatment groups led to increases in agricultural output, as the average value of crops (sold and unsold) increased 15.4 percent relative to the comparison group. Finally, researchers studied the effect of increased agricultural production on household consumption. Indeed, farmers in the treatment groups increased total household expenditures reported in the last 30 days by an average of 10.8 percent. None of the raffle treatments had any effects on savings behavior. Finally, the effects of the treatments on the use of inputs were larger than can be explained only by facilitating savings. Thus, providing evidence on mechanisms that provide a more complete explanation of the results (i.e. if increased savings led to increased eligibility for loans) should be an important direction for future research. Brune, Lasse, Xavier Gine, Jessica Goldberg, and Dean Yang. 2016. "Facilitating Savings for Agriculture: Field Experimental Evidence from Malawi." Economic Development and Cultural Change 64(2): 187-220. 1 Consultative Group to Assist the Poor/The World Bank. 2009. “Financial Access 2009: Measuring Access to Financial Services around the World,” http://www.gsma.com/mobilefordevelopment/wp-content/uploads/2012/06/fa20... (Accessed March 7, 2017).